Having some beautiful cut flowers in a vase in the middle of your dining room table or perhaps a nice flower arrangement from a Gloucestershire Florist can bring some colour into your life. Nothing beats the look of some flowers for cheering you up, particularly in the dark cold autumn and winter months. It is worth having a chat with your Gloucestershire Florist to help select the right flowers. You should think about the colours you are looking for as well as the look of the petal and also any aroma that they may produce. Roses – these tend be grown in a variety of countries across the world with the Netherlands being the biggest exporter of these flowers. You can find roses in a variety of colours as well as the standard pinks and reds. When cut they tend to last around 4-7 days depending on how you care for them. Tulips – another export of the Netherlands, these beautiful flowers tend to adorn tables throughout the Spring season. Again a variety of colours can be found along with bi-colour varieties. The look of the petals will depend on the variety of tulip and can include standard single petals, double petals and those with fringed edges. Tulips will typically last up to seven days in a vase. Asters – these daisy like flowers are a popular choice throughout the year to add some interest to a room. The colours include varying shades of pinks, lavenders, reds, purples and whites, all with beautiful yellow centres that we relate to daisy style flowers. Asters can last for an incredible 14 days of cared for in a vase. 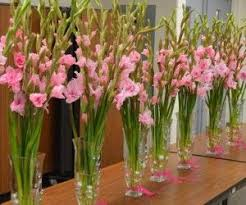 Gladiolus – these large stemmed flowers usually carry around 6-8 florets (flowers) per stem. 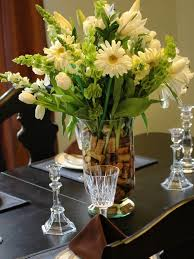 They help to create height in any vase display and are a popular choice for kitchen areas and for those looking to create a country cottage feel. Again these can be found in a variety of colours including pinks, yellows and creams. They will last between 7 and 10 days in a well placed vase. Iris – These beautiful flowers also have some lovely thin pointed leaves, meaning they can create a wonderful display just on their own. The most common colours tend to be blue-purple, deep purples and lavenders as well as white and yellow varieties available. These tend to last around 5 days in a vase.